Water Hyacinth is a real problem in the Southern United States . The plants are free floating, sometimes attached in mud. Plant height in variable from a few inches to three feet. The flower can be blue, violet or white. 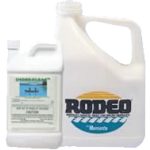 Economical control can be achieved with an application of Rodeo/Shore-Klear herbicide. Spray onto the dry emergent portion of the plants using a small pump up sprayer or spray bottle for smaller areas. Rodeo/Shore-Klear kills the roots!